Dr. Steve Ayers delivers the sermon today, July 8, 2018. Keith Fitch is the deacon of the week. He will read the Old Testament scripture and have the morning prayer. The flowers today are giving in memory of Shelia Mullis on her birthday July 7 and in memory of Shawn Mullis for his birthday on August 17. They are also given in honor of Sam Mullis on his birthday today; Sammy Mullis who has a birthday on August 16 and Sarah Burris for her birthday on July 28. 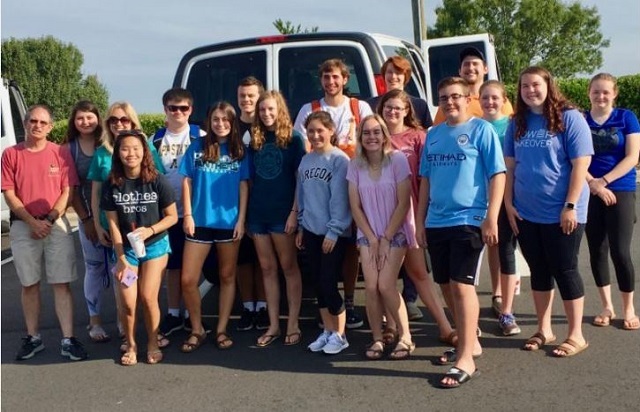 The youth left for Helena-West Helena, Arkansas Friday. They posed for this picture before they left for the mission trip. Please remember the Youth Mission Team who is in Arkansas this week. During the offertory today a song will be played that was recorded by Mr. Glenn Hartsell. July 9 would have been Glenn’s 94th birthday. We appreciate the wonderful legacy that Glenn left us. Need barbecue or brunswick stew?